I started reading Dune last week. It wasn’t until mention was made of the melting polar ice caps that Frank Herbert’s prescience struck me. 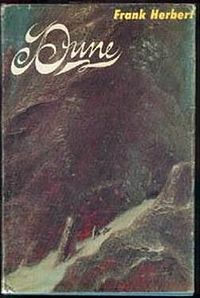 Dune was published in 1965. It immediately won the Hugo and the very first Nebula. Those are surely reasons enough to read this scifi novel, but for me there is something more. With Dune I glimpse the adult vision of the future that was taking hold at the same time I was being asked to formulate my own nine-year old view of that future. To give my personal historical context for Dune, I mention the following: I was born at the end of the summer of 1956. The Berlin Wall was erected “overnight” in 1961. The Cuban Missile Crisis of 1962 was an inexorable step in the Cold War that would cast a pall over my childhood. Rachel Carson’s Silent Spring hit bookstores that same year, spawning the environmental movement that is still alive today. Kennedy’s assassination in 1963 was the first in what would be a series of assassinations and/or racial violence in the US. The Beatles appeared on Ed Sullivan in 1964 and I was one of the nearly 73 million viewers who saw it live. When Dune was released in 1965, a typical school assignment called for us to make our guesses about the future. As was the case with most of my classmates, I looked forward to flying cars, two-way wrist radios, and discovering the truth about the composition of the Moon’s surface. Star Trek made its television debut in 1966, although I can’t remember if I watched it then. The first moonwalk took place in 1969. So did Woodstock. Those were busy, confusing times to be a kid, yet it never occurred to me that the future might be bleak and troubled. My childhood associations with that time period may be the reason I find Dune so upsetting. Then again, it’s possible our recent world experience of jihad lies at the root of my discomfort. Whatever it is, I find myself distressed enough at the thought that Paul will not be able to avoid his “terrible purpose,” that I almost cannot bring myself to finish this book. Maybe the truth is that I’m a dystopia weenie. Maybe I can’t help but be, since I have the next generation running around me as I type this. All I know is that I hope Paul can find a way to make Dune habitable and create a place of safety and beauty. Then maybe we can get those flying cars. Categories: Blog, MustReads | Tags: 1965, Berlin Wall, Dune, Dystopian Literature, Frank Herbert, Hugo Award, Nebula Award, Rachel Carson, Silent Spring, Star Trek, The Cuban Missile Crisis of 1962 | Permalink.